This gallery is dedicated to the memory of the bravest American I ever met, Matthew Charles Hays Freeman, Captain, United States Marine Corps. An incredibly gifted Harrier jet pilot, he volunteered for ground duty in Afghanistan to support his brothers. America salutes you every day, Matt. The author held a US Army press pass that entitled him to close-up seating and access to post-event press conferences. This collection of images was digitally scanned from Ektachrome slides thirty-plus years after the event. 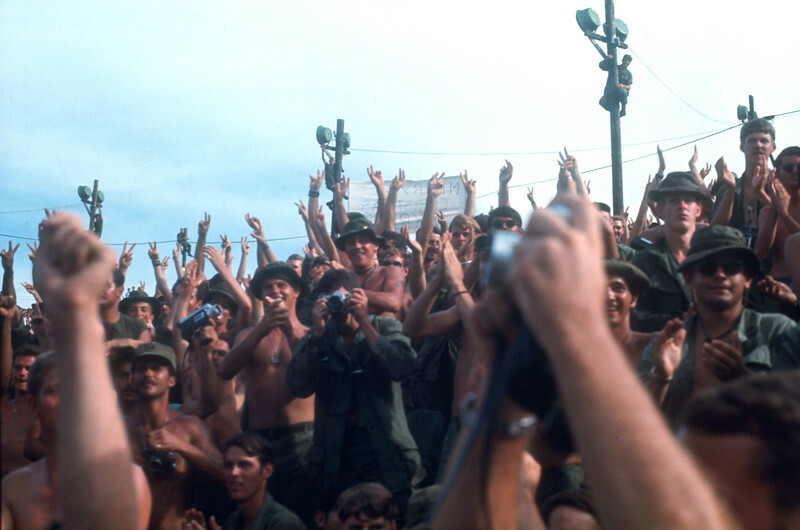 May God bless the Vietnam veterans on all sides of the conflict! May the Vietnamese people always live in peace! © 1970, MJ Roche. 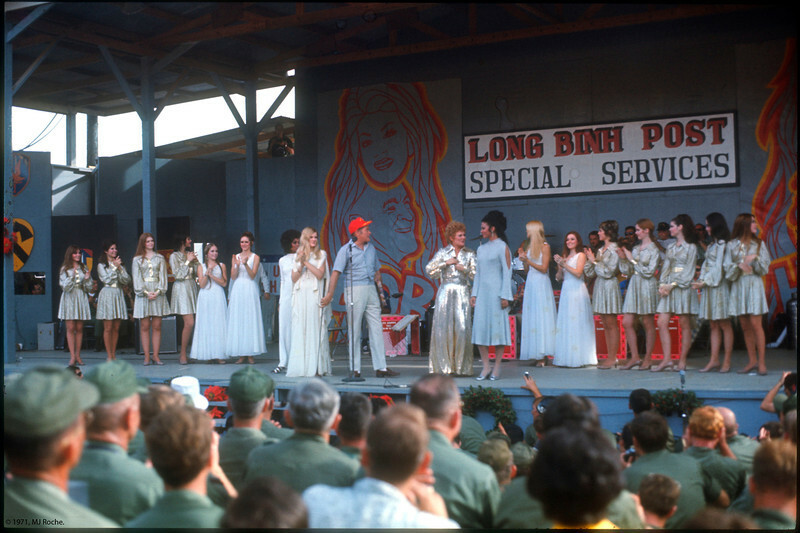 GIs welcome the cast of the Bob Hope Show from Long Binh on Christmas Day, 1970. © 1970, MJ Roche. 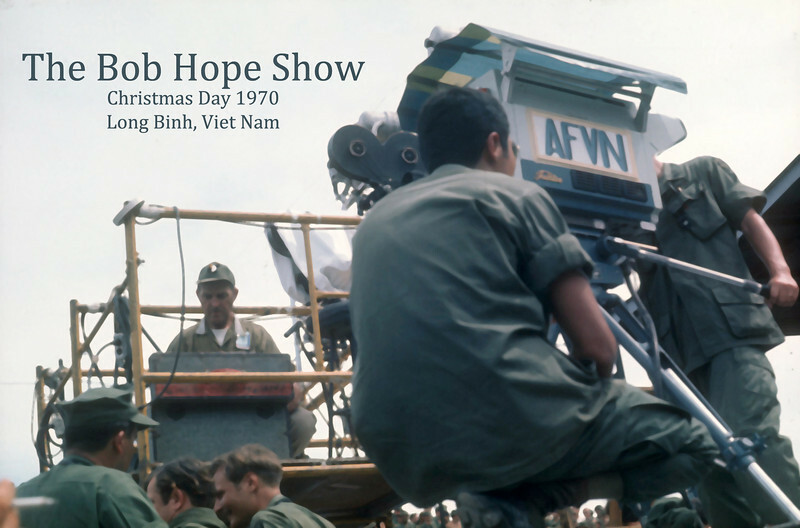 Long Binh audience at the Christmas Day Bob Hope Show. 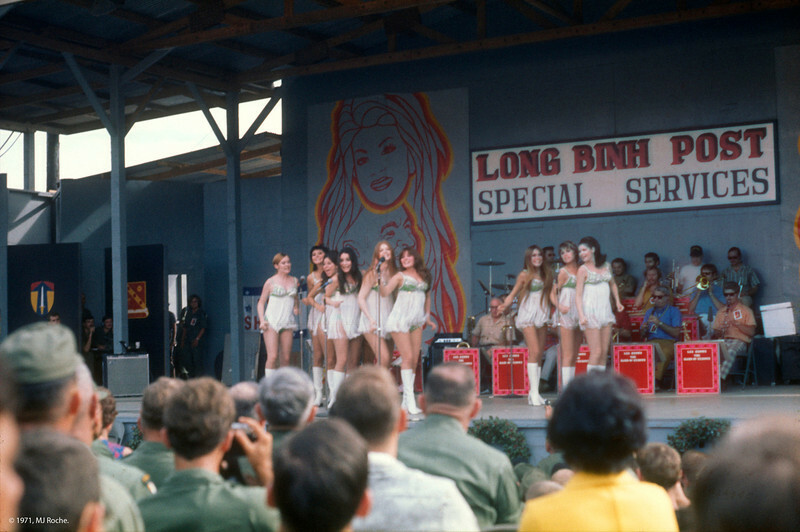 You will note the American civilian women in the audience. These were the spouses of senior military from units in the Saigon area! Thanks for that memory! © 1970, MJ Roche. 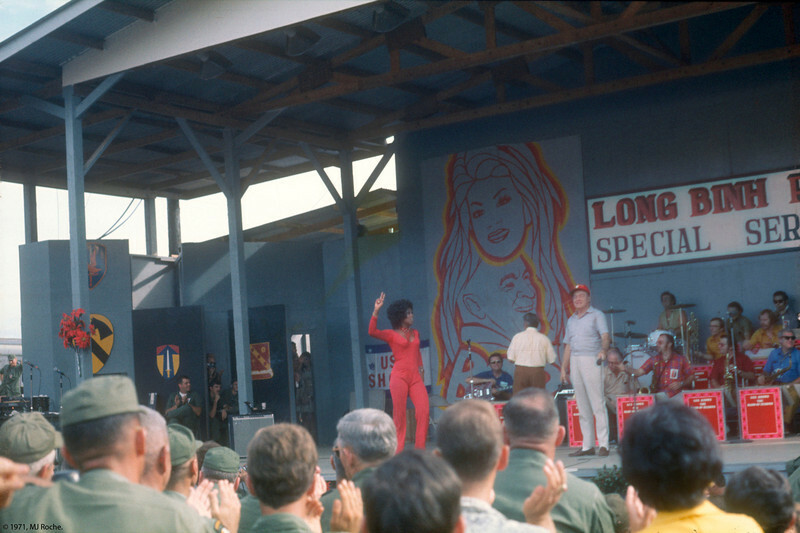 Lola Falana takes the stage at Long Binh, amid a torrent of cheers! © 1970, MJ Roche. The Golddiggers dance with Bob. © 1970, MJ Roche. 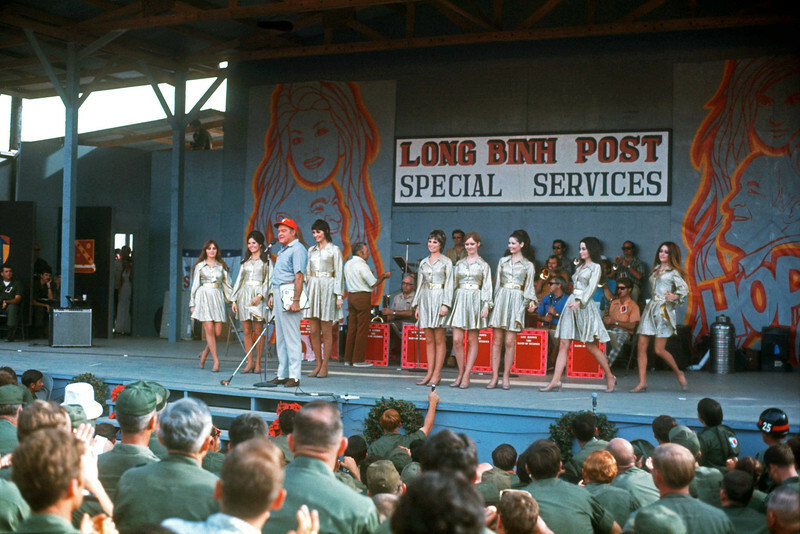 The "Goldiggers" from the Dean Martin Show take the stage at Long Binh behind Bob Hope (12/25/70). © 1970, MJ Roche. The Golddiggers sing a tune. 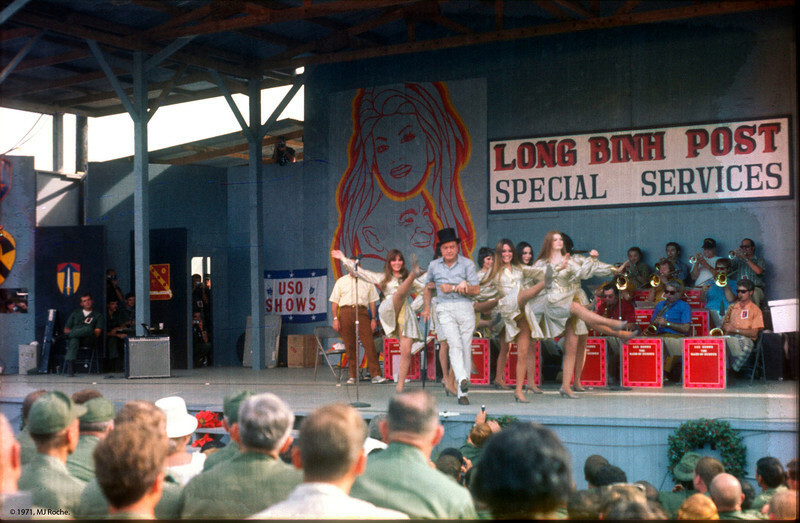 The group of singers/dancers originated on the Dean Martin Variety Show and toured with Dean in Vegas and other locations. © 1970, MJ Roche. Lola Falana, Gloria Loring, Hope, Bobbie Martin and Jennifer Holsten (Miss World, 1970), take center stage. © 1970, MJ Roche. 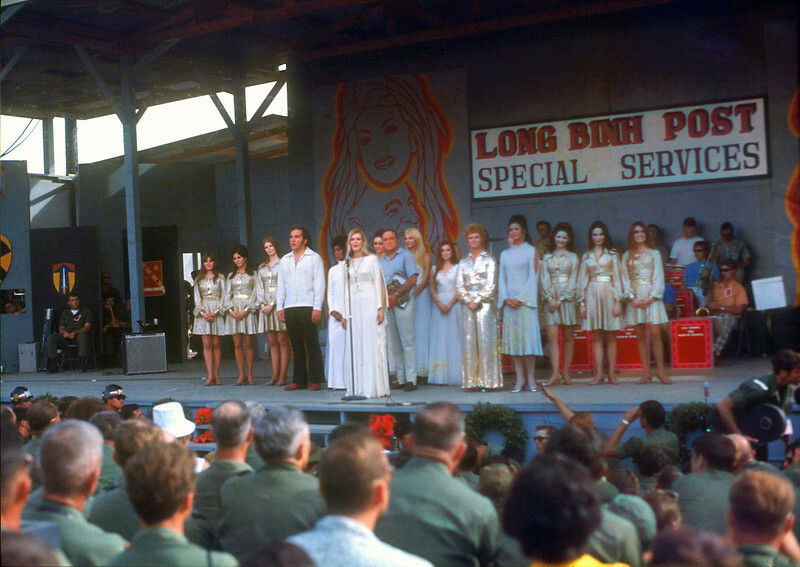 Gloria Loring leads the cast and audience in "Silent Night" (12/25/70, Long Binh). © 1970, MJ Roche. 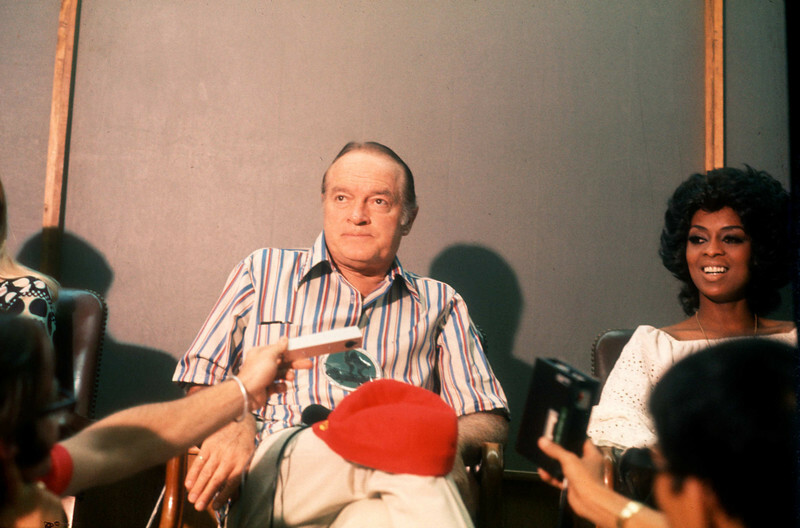 Bob poses next to Lola Falana at the press conference following the Christmas Day Show at Long Binh. © 1970, MJ Roche. 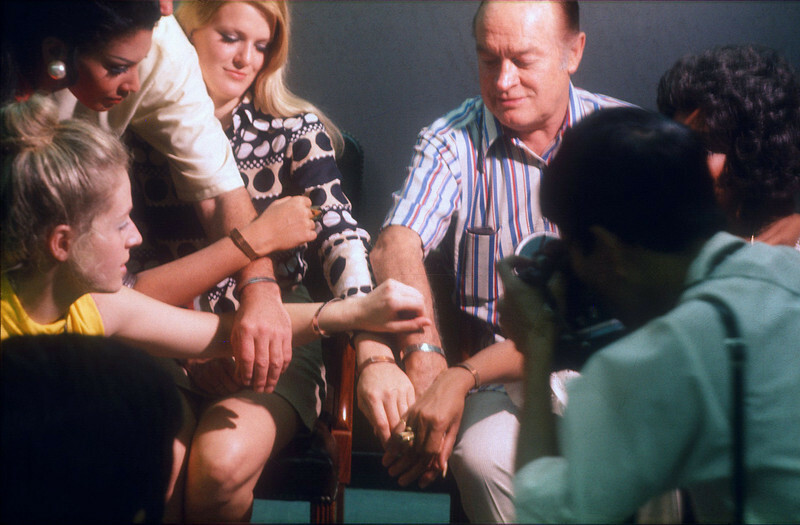 Bob, Gloria Loring, Jennifer Hosten from Grenada (Miss World, 1970), and others show off their POW bracelets at the press conference following the Christmas Day Bob Hope Show at Long Binh, RVN. 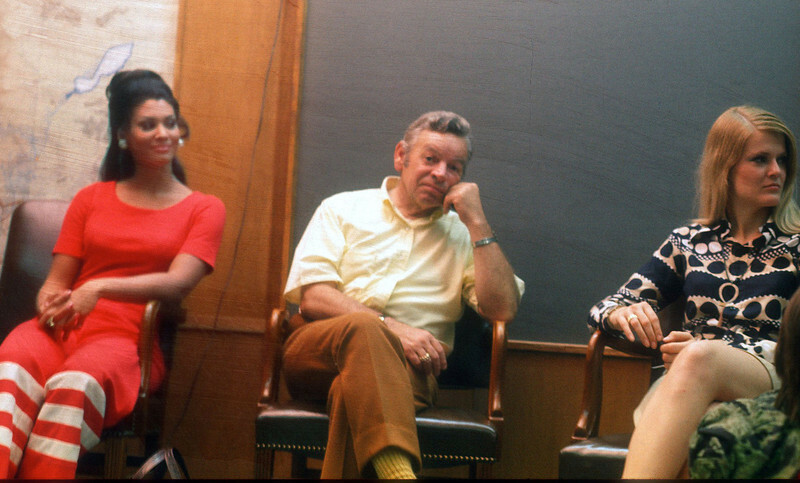 Jennifer Holsten, Miss World, 1970, Les Brown and singer Gloria Loring (from a damaged 35mm Ektachrome slide). © 1970, MJ Roche. 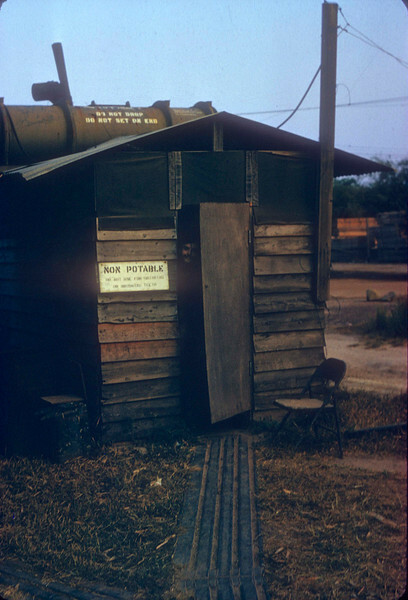 Admin Office, 3/13th Field Artillery, 25th Infantry Division, Cu Chi, RVN. Our quonset hut office during a repainting party in the evening. Digital scan from a 45 year-old Polaroid print. October 1970. © 1970, MJ Roche. Charlie Johnson, from Ohio, helps me read a letter from home. © 1970, MJ Roche. An article and drawing that appeared in the "Tropic Lightning News" on September 28, 1970. This publication was the weekly newspaper of the 25th Infantry Division. 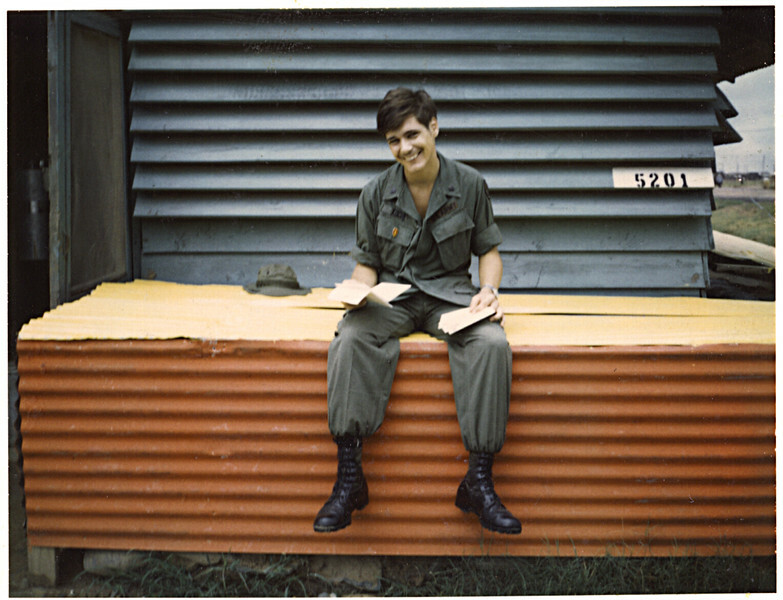 Major Kelso was the CO.
Mail call in front of the hooch at Cu Chi. The 3/13th Field Artillery basecamp area was noted for having red and yellow accents painted throughout the HQ unit, including rocks lining the walkways. CSM Monsees was a very serious soldier. Since we were all prettied up and directly next to the wire, was the 3/13th a target for VC rockets? Photo by Ed Yocum. Củ Chi Base Camp was established in 1965 near Highway 1, 25 km northwest of Tan Son Nhut Air Base and 50 km southeast of Tây Ninh. 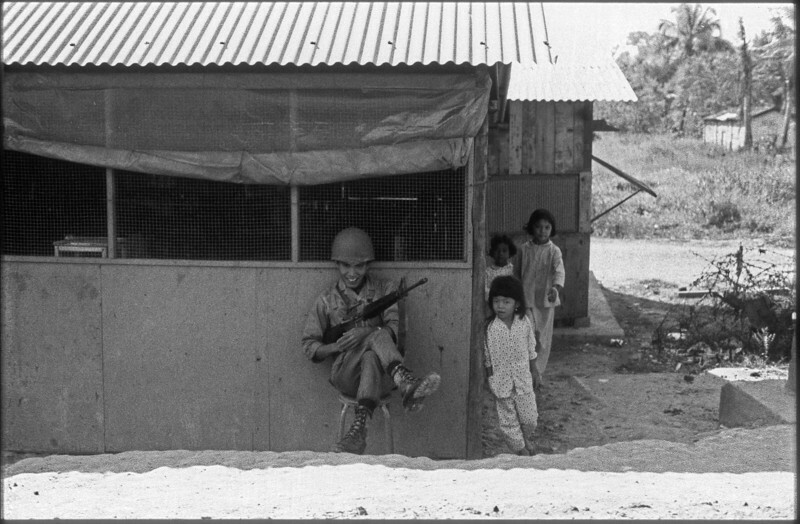 The camp was located south of the Vietcong stronghold known as the Iron Triangle and was near, and in some cases above, the Cu Chi Tunnels. © 1970, MJ Roche. 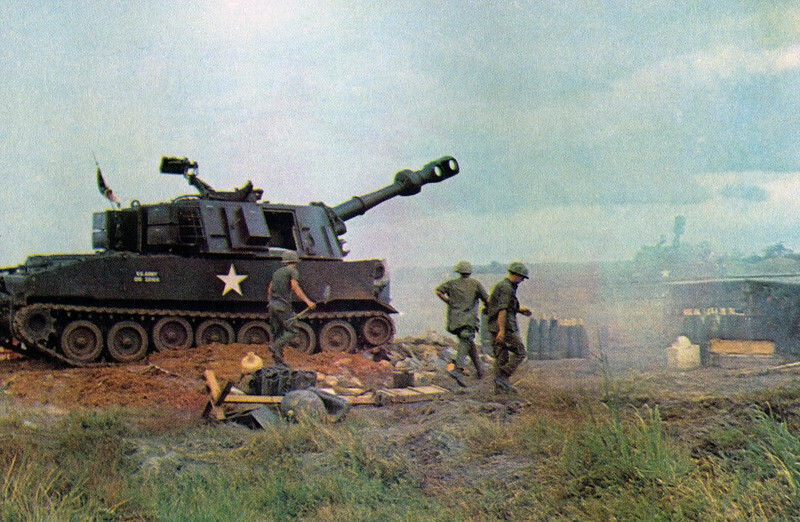 A 155mm Howitzer from the 3/13th Field Artillery of the 25th Infantry Division at their basecamp at Cu Chi. The battalion had three 155mm self-propelled (track mounted) companies and one self-propelled 8-inch gun company. 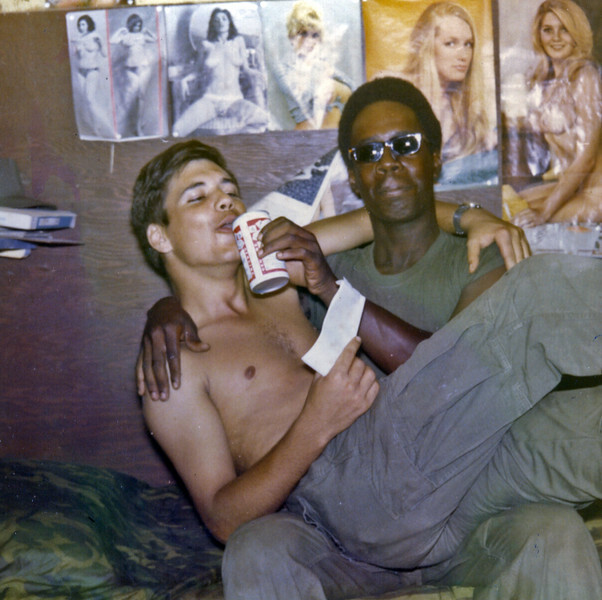 Photo, 25th Inf. Div. 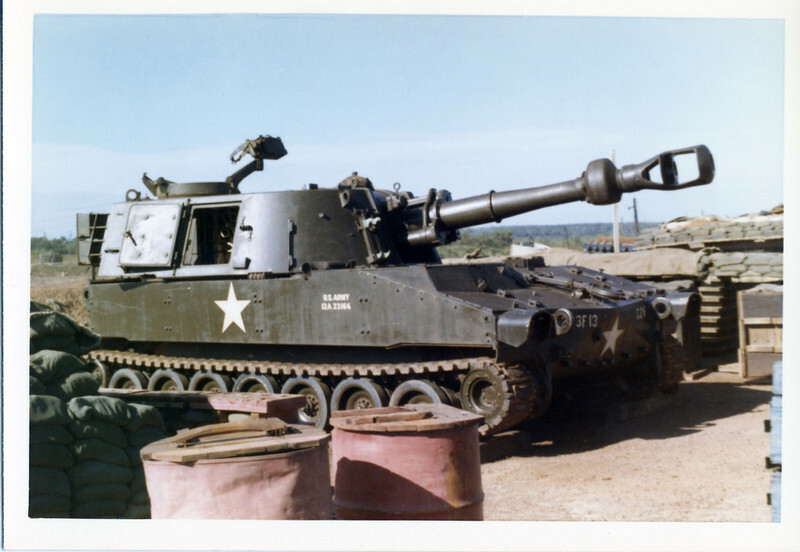 A 155mm Howitzer from the 3/13th Field Artillery of the 25th Infantry Division at a Fire Support Base. 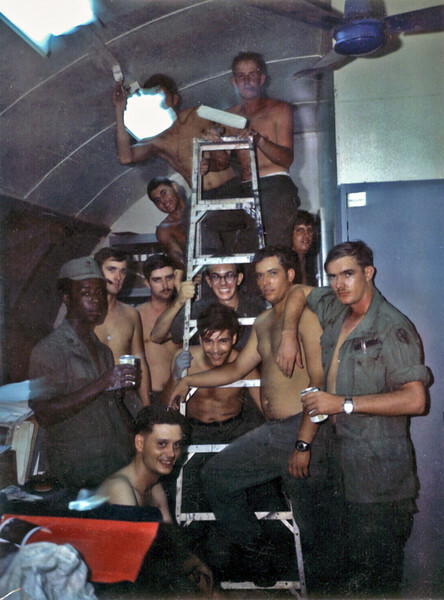 Photo, 25th Inf. Div. 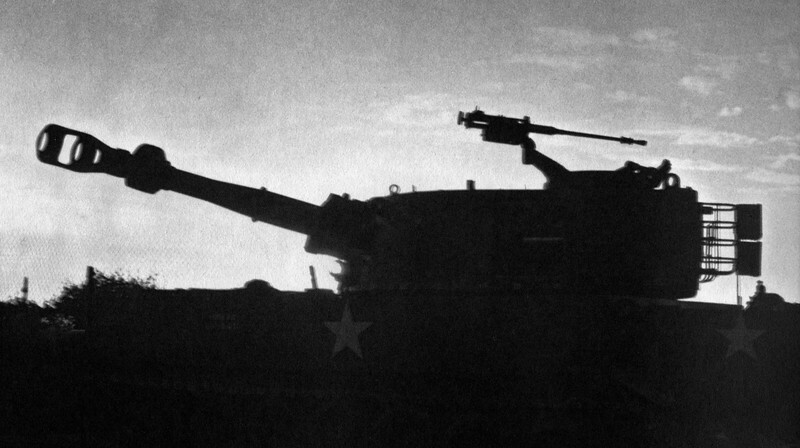 Silhouette of a 155mm Howitzer from the 3/13th Field Artillery of the 25th Infantry Division at their basecamp at Cu Chi at dusk. Photo, 25th Inf. Div. Just outside "the wire" at Di An Basecamp, February, 1971. 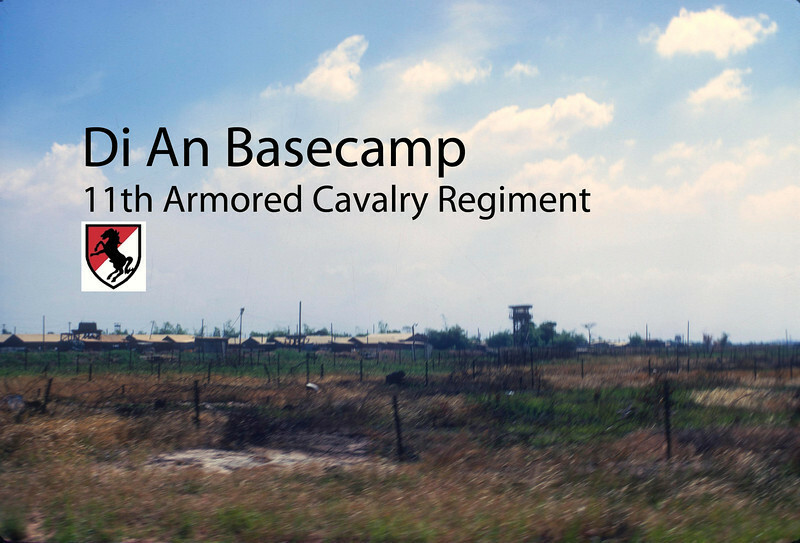 Symbolism: The colors red and white are the traditional cavalry colors and the rearing black horse alludes to the "Black Horse" nickname of the 11th Armored Cavalry Regiment. Background: This insignia was approved on 1 May 1967. © 1970, MJ Roche. 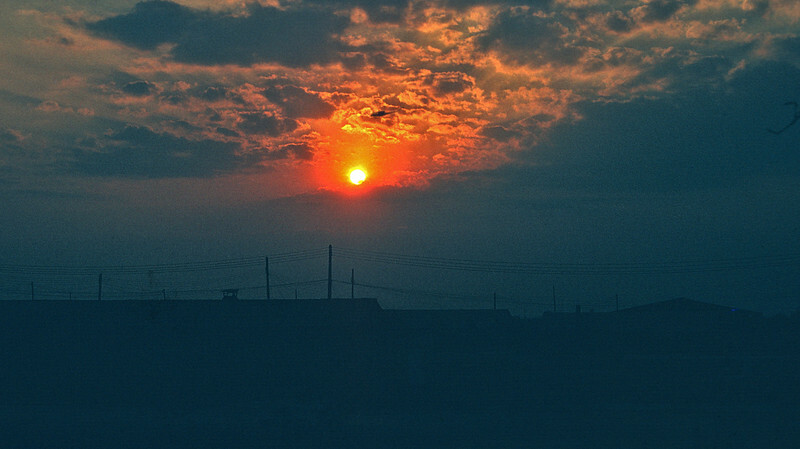 Dusk at DiAn, December 1970. © 1970, MJ Roche. Mending a broken leg at Di An in front of our 17th PID (Public Information Detachment of the 11th Armored Cavalry Regiment). © 1970, MJ Roche. Fancy shower with torpedo tube filled every third day with non-potable water. Magically heated by 3pm daily. During the dry season, you would shower, walk to the hooch 35 yards away, and write your name on your arm in the red dust that would adhere to your moist skin. © 1970, MJ Roche. 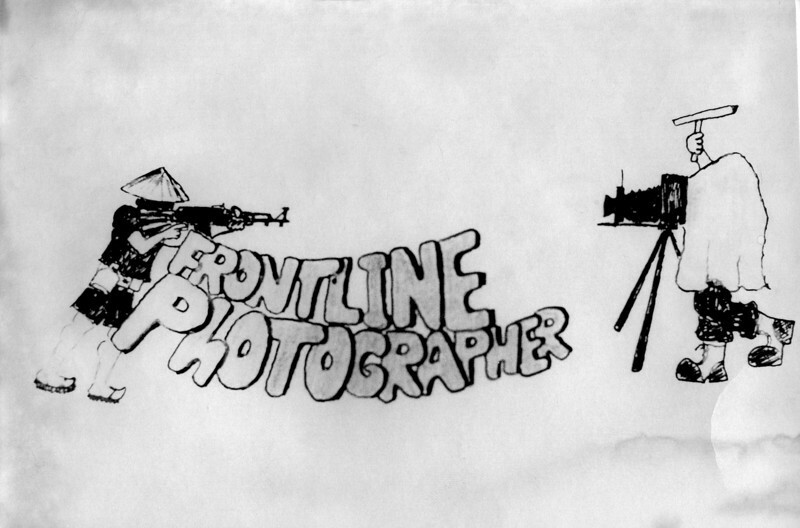 71Q (Army Journalist) drawing highlighting the exciting aspects of the job (11th Armored Cavalry Regiment, Di An, Vietnam, 1970). Artist unknown. 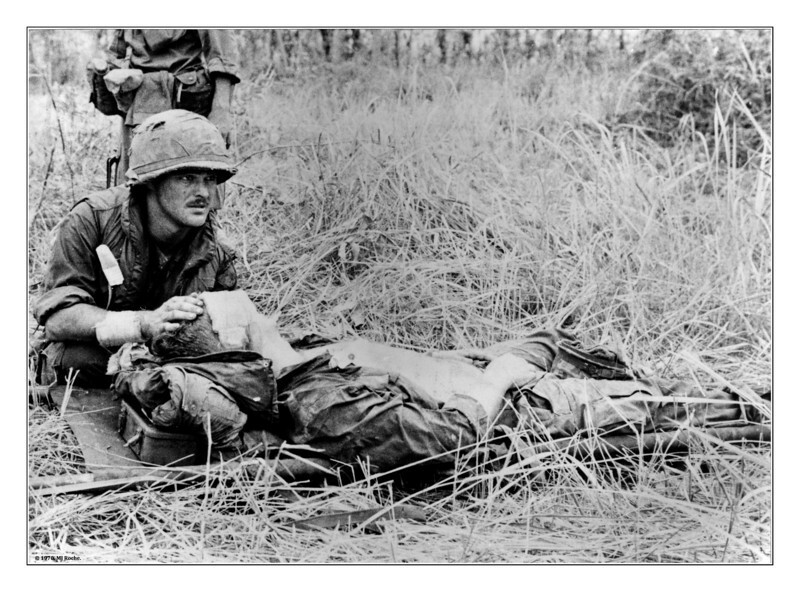 "Hang On" Awaiting a medevac chopper after a VC mortar round injures a 25th Division infantryman near Tay Ninh in October 1970. 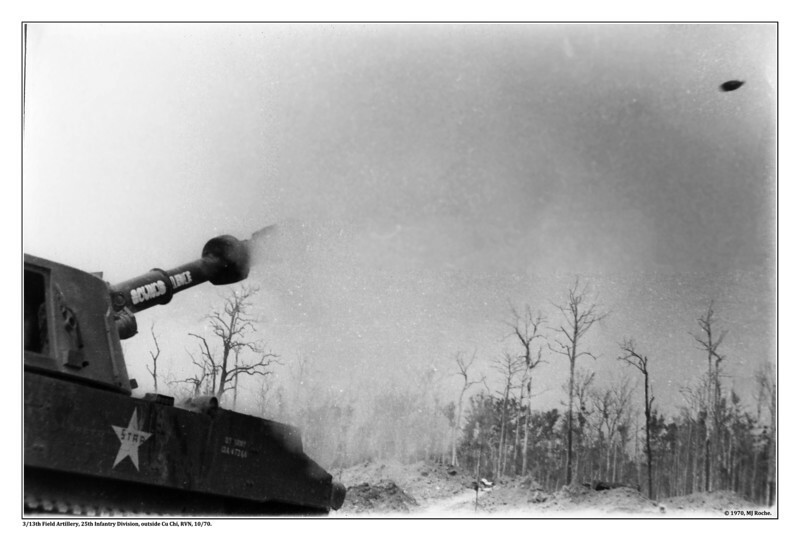 Overlooking the Michelin rubber plantation just west of Cu Chi a 155mm self-propelled howitzer fires a round in support of 25th Infantry Division troops (3/13th Artillery Battalion). Photo by Mike Roche with an Asahi Pentax Spotmatic, one of the first, popular 35mm single lens reflex cameras, with TriX Pan 400 ISO film (in October 1970). This photo was accepted into the permanent collection of the Veteran's Art Museum, Chicago, IL, 2016. © 1970, MJ Roche. 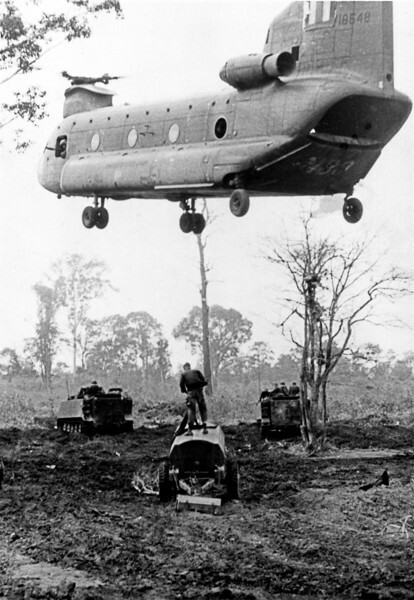 Water delivered by a 25th Infantry Division Chinook, "Shithook", helicopter in the field. © 1970, MJ Roche. Post monsoon bath. © 1970, MJ Roche. 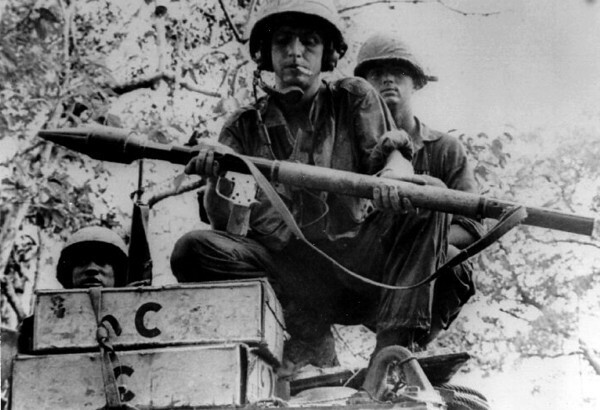 11th Armored Cavalry Troopers examine an enemy RPG recovered on a mission near the Cambodian border in 1971. US Army photo. R.J. House applies seasoning on the barbie behind our hooch. 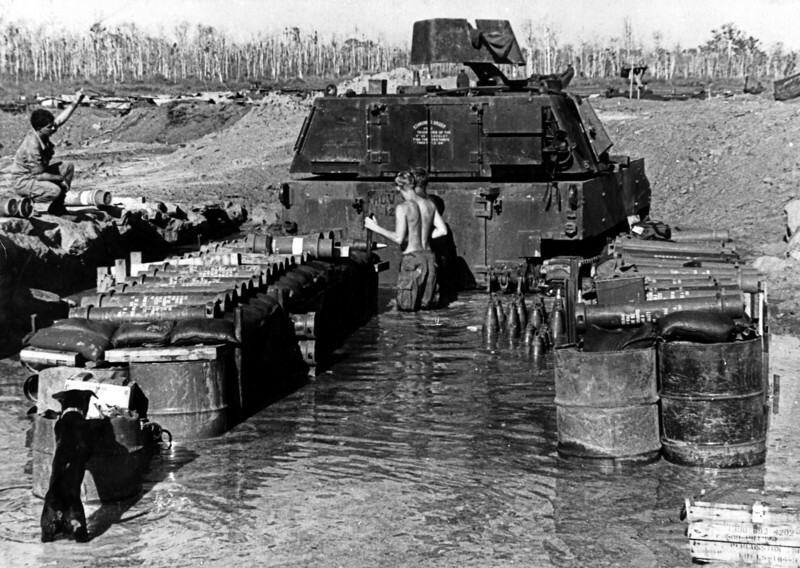 You will note the sandbagged 17th PID bunker in the background. © 1970, MJ Roche. 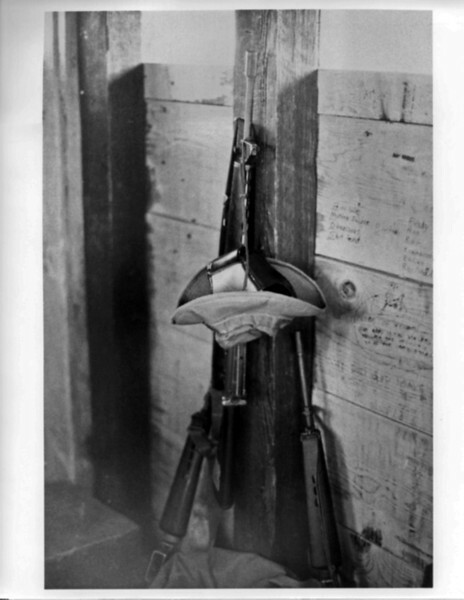 "The Things They Carried" after the Tim O'Brien novel of the same name (11th Armored Cavalry Regiment photo). 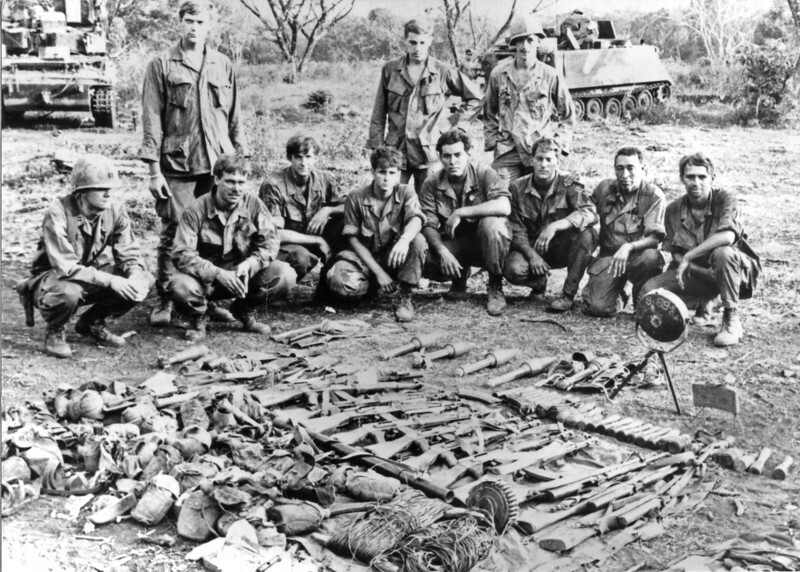 Satchel charges, grenades, several rifles, RPG rounds, and anti-personnel devices. 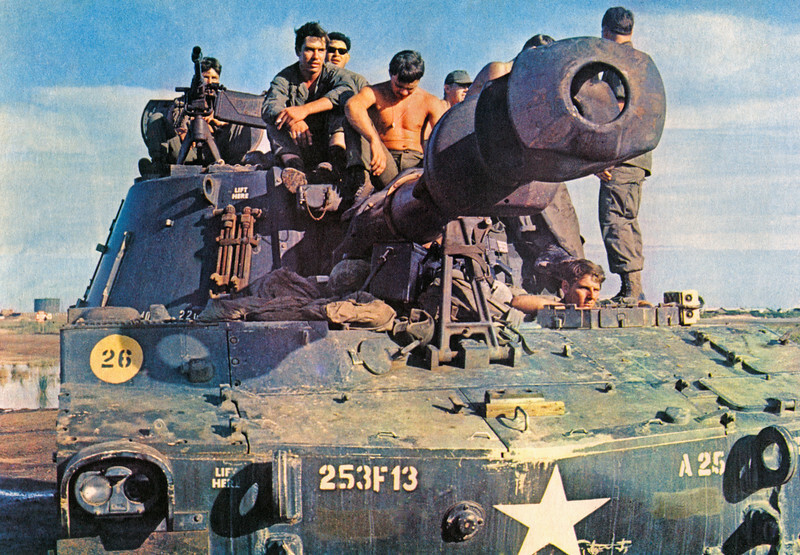 Blackhorse Troopers check map coordinates from the deck of their M48A1 Patton Tank just a few kilometers east of the Cambodian border in March, 1971 . This photo was published in 2007 with the permission of the photographer in a United Kingdom edition about umbrellas. © 1970, MJ Roche. 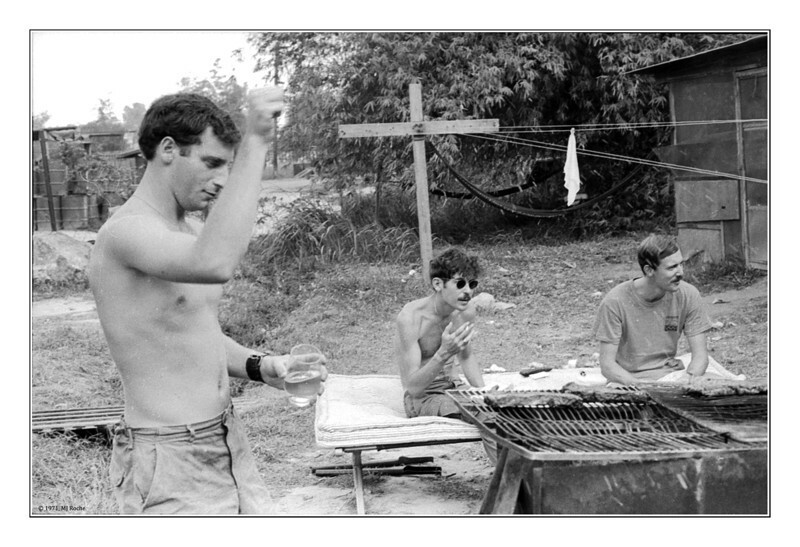 Jeff Lowe, Bob Eveler and Paul Mahoney behind the hooch at Di An, barbecuing beef from PX. © 1970, MJ Roche. 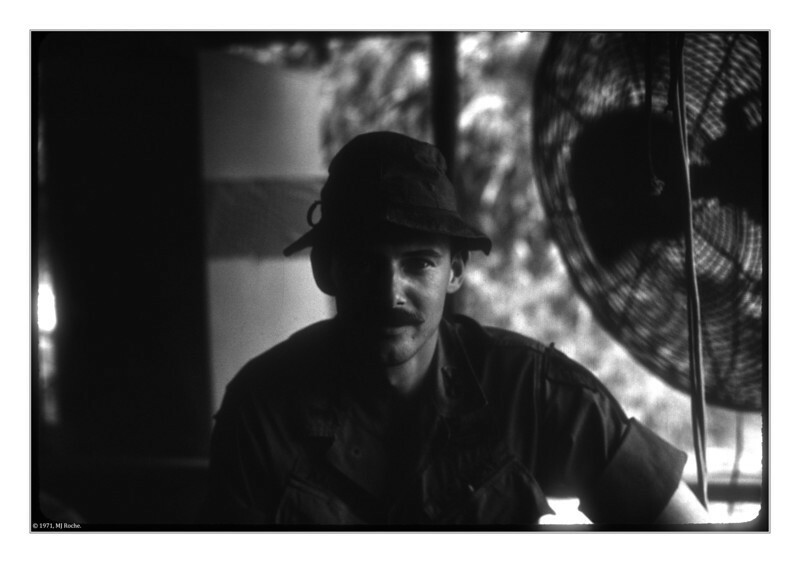 Lieutenant Paul at the hooch in DiAn. © 1970, MJ Roche. 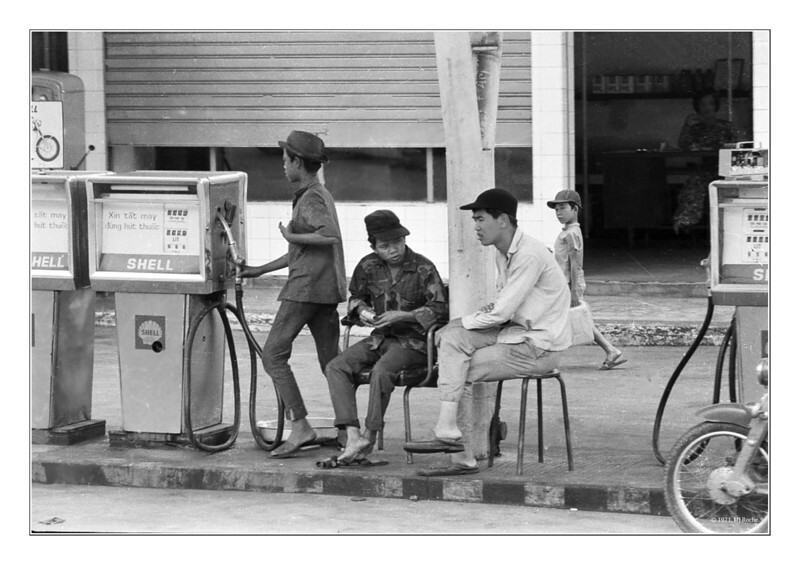 Saigon taxi, December 1970. © 1970, MJ Roche. 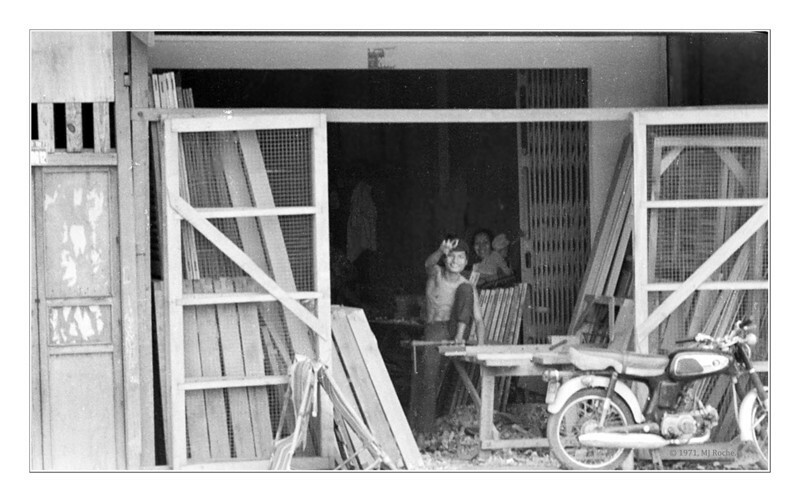 On the outskirts of Saigon, December 1970. © 1970, MJ Roche. 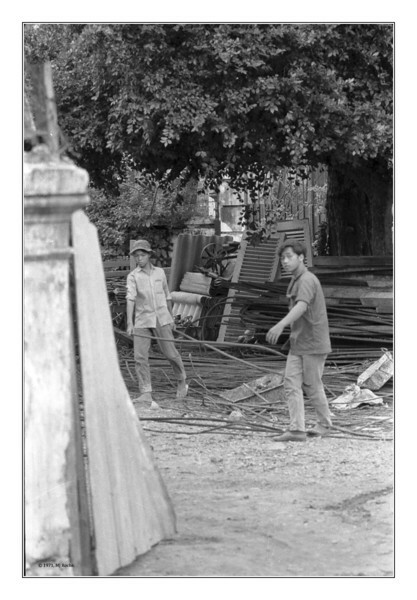 Street scene near Saigon. © 1970, MJ Roche. 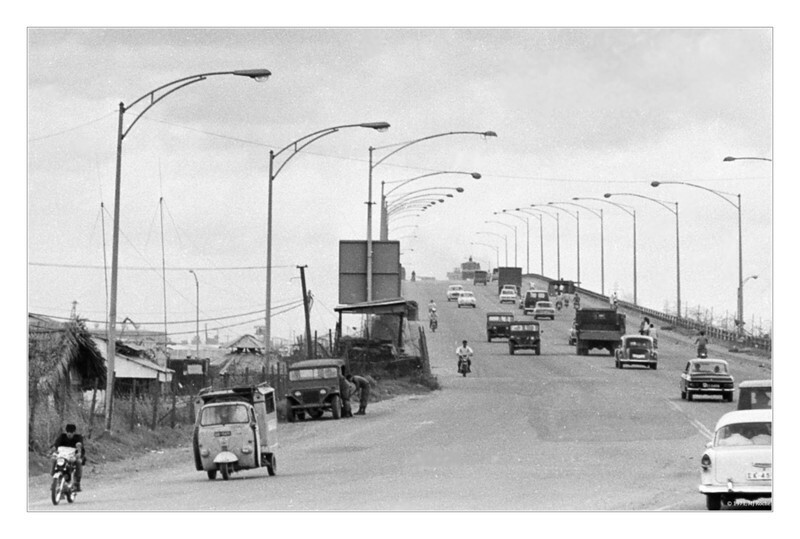 Bridge between Di An and Saigon. © 1970, MJ Roche. 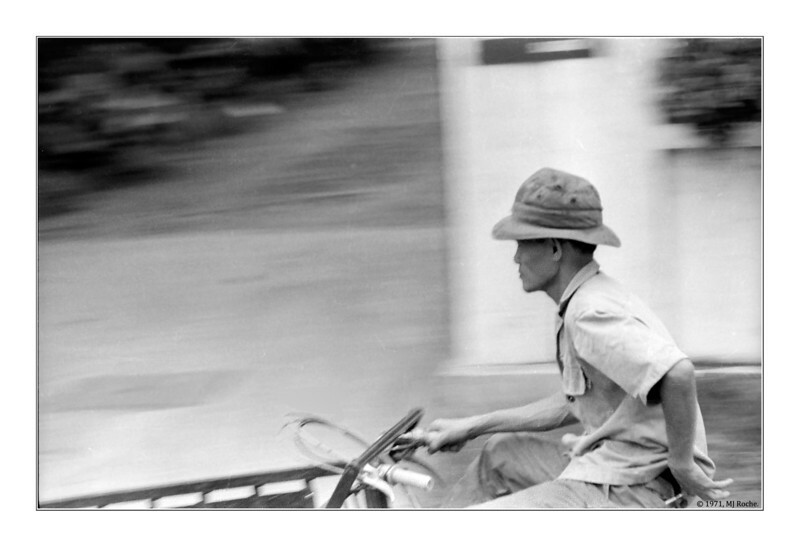 Saigon street. © 1970, MJ Roche. Children and war mixed every day. 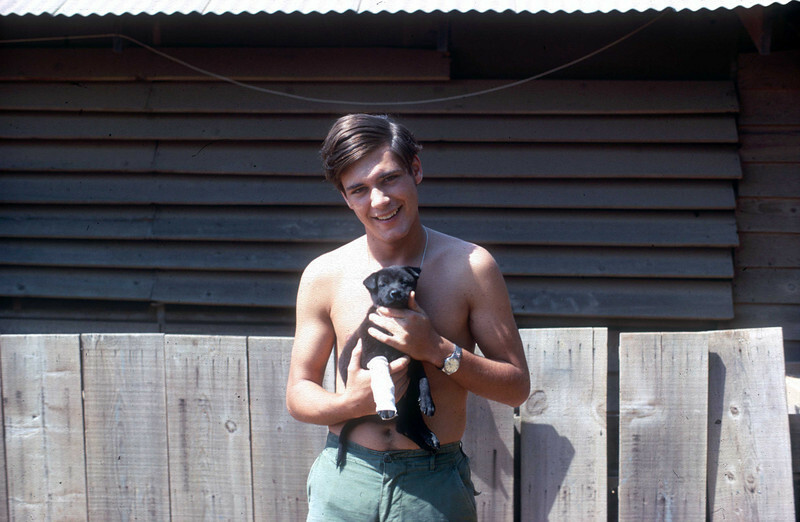 Scanned from a damaged Kodachrome color slide, © 1971, MJ Roche. Inside a courtyard in Saigon. © 1971, MJ Roche. 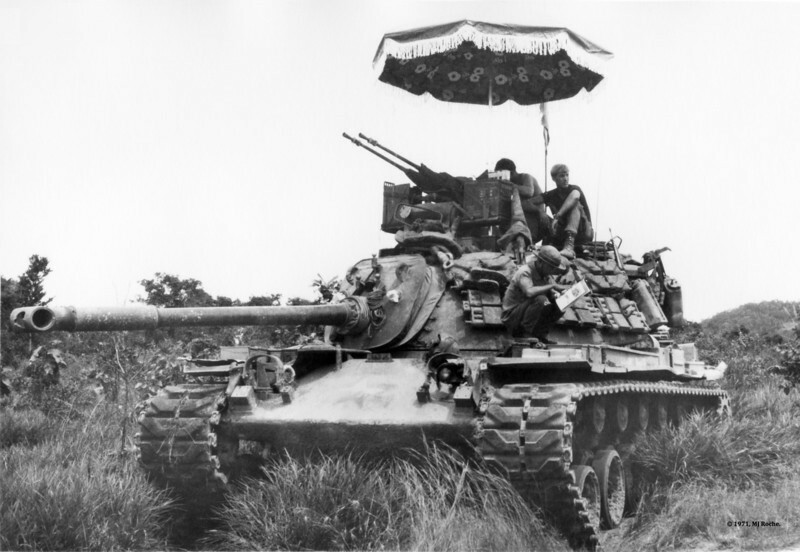 Three sixteens, and a boonie hat inside a hooch, Cu Chi (25th Infantry Division). Inscriptions on the wall are from former residents. © 1970, MJ Roche. Homemade Christmas card mailed home, December, 1970. (17th Public Information Detachment, 11 Armored Cavalry Regiment, Di An, RVN). Bottom row left to right Ralph ..., Jack McAllister, Ed Yocum. Middle row Mike Roche, Bob Eveler. Top row Jeff Lowe, Rod Covington, Joe Marchesani, Darrel Jensen. Taken in the rec. area at the back of the 17th PID hooch, which combined our barracks and our office. 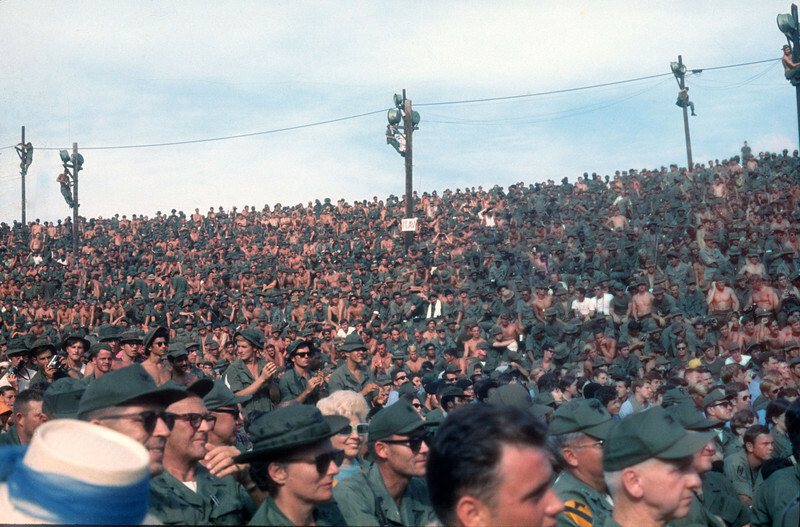 Processed in the 11th ACR Photo Lab Duece-and-a-Half at Di An by Ed Yocum. 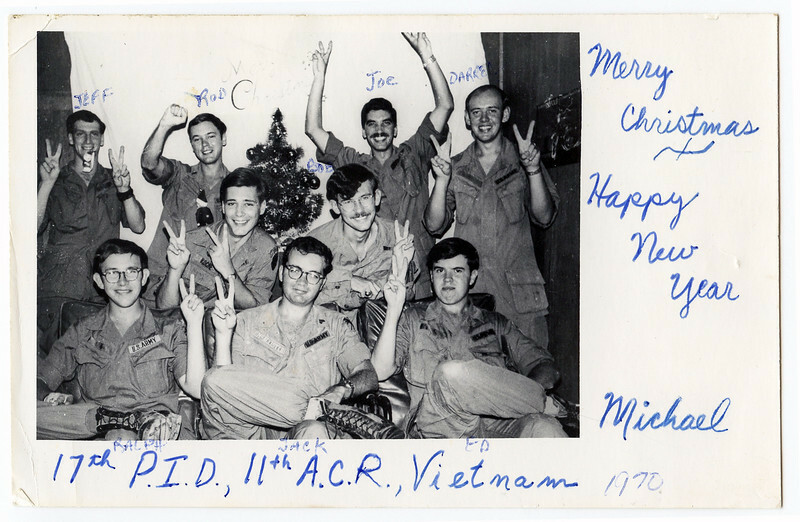 Photo by RJ House 28th Military History Detachment, Di An. 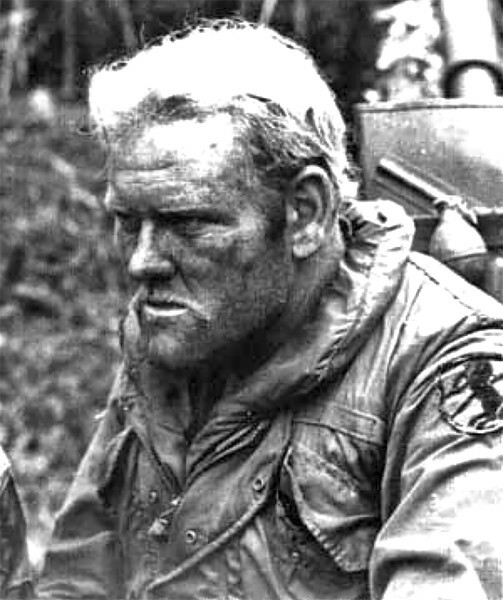 A true, field-hardened 11th ACR trooper during the Cambodian assault in 1970. This brave man has been identified by his family members! He is Leon Lester Woodruff of Tulsa, Oklahoma. He left us in late 2016 . Photo: Tom Rosini. Moving through brush on a search and destroy mission, near Dau Tieng, January 1971. Four-star General Creighton "Abe" Abrams speaks to Blackhorse Troopers outside of Regiment Headquarters at Di An. 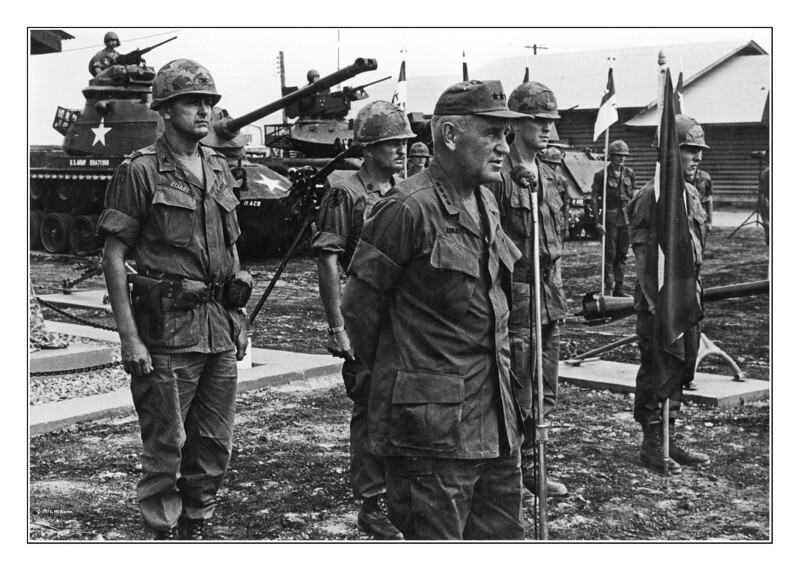 Colonel Donn A. Starry (the highly decorated commander of the 11th Armored Cavalry © 1971, MJ Roche. The M109 155mm Self-Propelled Howitzer at a fire support base on the border of Cambodia. The "3F13" marking on the front refers to the 3rd Battalion of the 13th Field Artillery, embedded in the 25th Infantry Division. 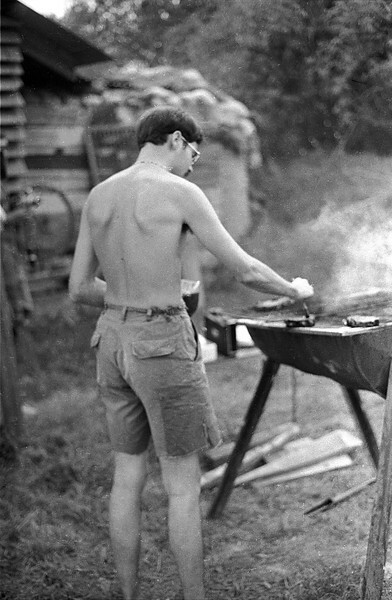 Taken in August 1970. Photo by MJ Roche. © 1971, MJ Roche. 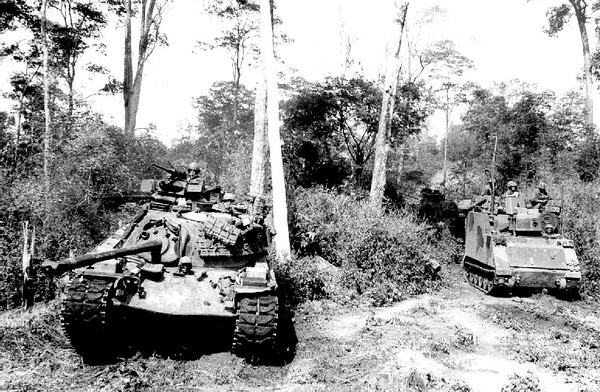 The pock-marked countryside outside of Cu Chi where the 25th Infantry Division basecamp was located. 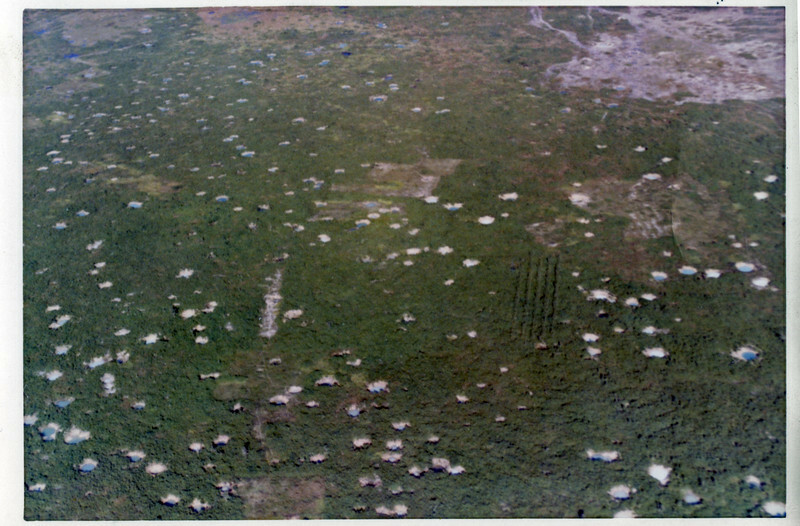 Seen from a Huey helicopter in September 1970. Many of these "pools" were later used by the Vietnamese for fish farming. Unexploded US Ordinance is still being found in 2015 throughout the Vietnamese countryside. © 1971, MJ Roche.